Dreamscape painter Andy Russell loves Matisse acrylics! 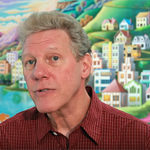 Artist Andy Russell is widely recognized as a master in acrylic painting. 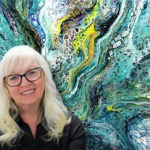 He embarked on his artistic journey over 35 years ago, when he began having recurring dreams of vibrant and ethereal landscapes, which he then started translating into acrylic paintings of immense detail and glowing tones. He describes his painting style as “extended realism” — peaceful, utopian dreamscapes with impossible foliage and amazing architecture. Russell’s unique style is accomplished through multiple glazes and layers of acrylic paint, and he finds the Matisse line to be perfectly suited to his painting technique! Watch the video below to hear about Andy’s background, inspiration and technique in his own words, and get a glimpse into his perfect worlds! “Matisse Acrylic Paints have proven to be a pleasure to work with in so many ways. They are of the highest quality, richly pigmented and creamy smooth and perfect for the professional artist. “I use Matisse Structure Acrylics for a thick textured, bold impasto look and Matisse Flow Acrylics for the smooth, highly detailed results. They are also excellent for covering large areas. “I love colors and they come in a full range, which makes me feel like a kid in a candy store. I almost think of them as flavors. I really like their unique colors such a Cadmium Orange Deep, Australian Red Violet and Australian Blue Gum, Australian Salmon Gum and Australian Sienna. After years of painting in acrylics, it is exciting and refreshing to use these new colors. Discovering them was like getting a ‘booster shot’ of creativity for my work. “Matisse has everything I need from mixing mediums to varnishes, from Background Colors to Mix-In Dry Mediums. I have found that using Matisse Background Colors are great for covering large areas. I use a lot of Phthalo Blue in my skies, which is very transparent and requires at least six coats for my purposes. I have discovered I can use one coat of Midnight Blue Background Color and only two coats of Phthalo over that and get the same results. This not only saves money but also leaves me more time for the more creative parts of the work. “I plan on trying almost everything they offer as I go and can hardly wait to experiment in opening new avenues for creativity. “I have realized that mixing their Magenta Light and Cadmium Yellow Medium with varying amounts of Titanium White gives me a glowing, brilliant color for sunset and sunrise skies. “Spreader Medium is perfect for the glazing technique. It gives a smooth, even coat of transparent color for brilliant results. 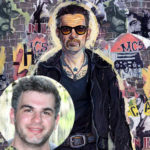 Learn more about painter Andy Russell and Matisse Acrylics, and visit his official website at www.andyrussell.com. What do you think of Andy’s beautifully surreal paintings? What have your experiences with Matisse Acrylic Paints been? Tell us about it in the comments below!